Cut. Roll. Glue. Pin. Repeat. It's adorable, right? I'd love to say that it's entirely my idea... but that'd be a lie. 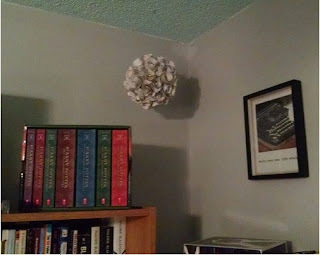 It was actually my friend who discovered this nifty little thing somewhere on the interwebs and decided she was going to enlist my craftiness and DIY attitude to just make our own!! If you're looking at it and still thinking, "Sure it's cute, but what the heck is it?" I can understand. Technically, this thing was originally created to be a bridal bouquet (why couldn't Pinterest have been around when I was getting married?!). We took the original idea and decided to make them as "centerpieces" instead! 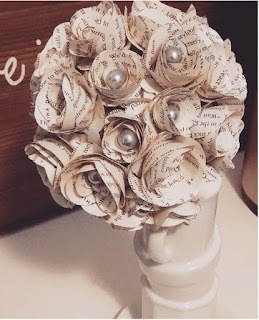 A mutual friend was having a wedding and we wanted to throw her a little bridal shower "Coffee and Books" was the theme, with a little brunch and some fun times thrown in. Most of the stuff was DIY, but this was definitely the coolest of them all! Using a template we saw someone else selling, my friend decided to copy the idea and adjust it to our needs. Of course I painstakingly scoured through my bookshelves for very weathered and uninteresting books (yes, there is such a thing, see: Jerry Springer biography... it was my husband's don't judge me). First I created the template and put it onto my computer. There are these flowery looking, circular templates that come in 7¼, 6, 5, 4, and 3 inch sizes. See this chic's Etsy page for a visual. Then I set it up to print out within the confines of the page dimensions. I tore out (yes, the book gods are cursing me now and forever) the pages and ran them through my printer, directly printing the black lined template onto the page and then cutting them out. It took us an entire day JUST to cut everything out. And man, were there lots of them! The next step in the process is to "roll" up the little spiral cutouts to resemble a rose (each individual bud is a singular cut-out spiral). Once it's rolled tightly (we spun it around a pencil), let it loosen a little, then hot-glue it together. Then, stick a fancy tipped pin (we used pearl tips, some people use rhinestones or other colors that match whatever they're decorating for) into the center of each bud and shove into a foam ball. Our foam balls were WAY larger than most people's who do this, so we actually ended doing about double what would normally be used. You just repeat this process until the whole ball is covered... it took us TWO WHOLE DAYS both doing equal amounts of work! Cutting, spinning, gluing, sticking, repeat. We did one GIANT , two large sized, four medium sized, and two small. They looked great at the shower and I even asked to take one home with me. It may have taken a lot of time, but it was super simple, kinda fun, and had an amazing end result. Mine is now a proud member of my book/words/writing wall in my bedroom and I love it so much, I may make a few more to hang up! !